It was a bright, warm Saturday at the start of May 2018, the first beautiful weekend for months and months, and I did one of my occasional cycle rides down from the north Norfolk coast into the centre of Norwich. Two of the churches I visited that day don't have much in common except for one notable feature, as we shall see. 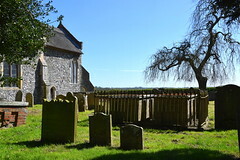 The first of them was All Saints, Thurgarton, a sad, lost little church to the north of Aldborough. There is barely a village at all, and a towerless church can disappear into the lattice of lanes on an ordnance survey map of Norfolk. All Saints' lonely spot by a remote crossroads does not easily catch the eye. In fact, this church was nearly lost to us. 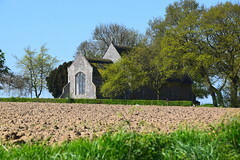 Abandoned in the 1970s, when Mortlock came this way in 1980 he found the thatch in a dreadful state and the inside of the church propped up with scaffolding. The churchyard was completely overgrown. 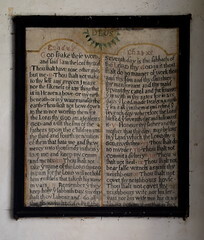 When I first (and last) visited Thurgarton church almost fifteen years ago, I found that it had been restored to a fine state of health thanks to the tender mercies of the Churches Conservation Trust. The thatched roofs were renewed, the walls made sound, and the treasures of the church cared for once again. 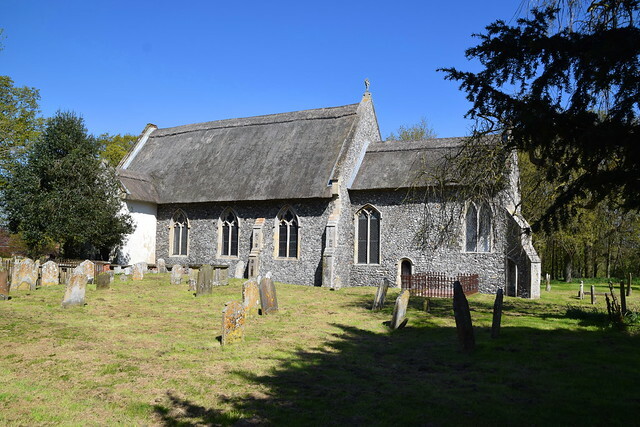 The tower fell in the 1880s, and as at nearby Ingworth the stub of it was made into a vestry, its roof ridged and thatched in an echo of the nave. The chancel appears to have been truncated (Pevsner hazards altered), judging by the proximity of the south-east window, and a funny little flying buttress used as a prop in that corner. 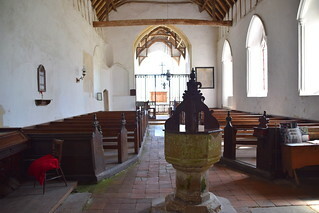 The south porch is big and plain, and one of the headstops to the arch appears to be a cat. I remembered the sadness of the interior on my previous visit. Back then, I'd had to get a key, but today the church is open every day. You step in to dust falling through the air and the smell of age. 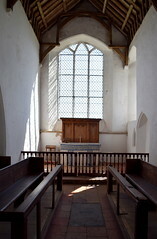 There is no coloured glass, and this is an interior of wood and plaster. The great survivals are the bench ends, which have done remarkably well considering that they spent a few years exposed to the elements. Ironically, anywhere else you would complain about the dark, tarry Victorian varnish with which they are covered, but here, it probably saved them. 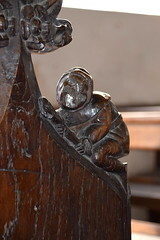 The best are two figures who creep up on the scene on the other side of the bench end. 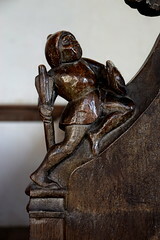 One appears to be wearing armour and carrying a shield and staff, the other may by a shepherd, because what he carries appears to be a crook. One approaches a dragon, the other two dogs fighting. 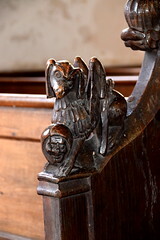 Even more interestingly, a winged figure, possibly a gryphon, holds a man's head in its paws - there's something similar on the other side of the Broads at Neatishead. 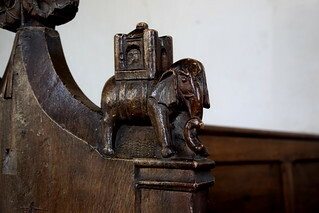 A man plays the bagpipes (though the bag itself has been lost) while another plays the lute, and there is an elephant and castle, the elephant with a twisted trunk. 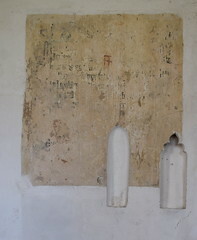 Other survivals of the years of neglect include a haunting framed decalogue board, probably of the 17th Century, and fragments of Elizabethan texts on the wall, one punched through with two earlier medieval image niches which must have been plastered over before the text was painted. 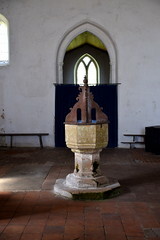 The medieval font has an 18th century cover, although there's no telling if it came from here originally. 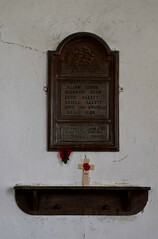 The wooden war memorial, which may have been locally made, has six names. Pevsner mentions a 15th century alabaster panel, presumably from an altar, which was found in the church in the 19th century. It seems no longer to be here, and when I mentioned it to the keyholder back in 2005 she hadn't heard of it. Still, so much has survived to be thankful for. And now, that curious connection. About seven miles off to the south-east is the village of Tuttington. This makes them sound close and conscious of each other, but I visited eight churches on my journey between the two, and the town of Aylsham also sits between them. Around here, pretty villages huddle in the dips, and roads obey the old medieval strip field plan system, cutting back at dog leg angles for no apparent reason. It was a journey through a crazy lattice of angled and high-hedged lanes, and I was thankful for my ordnance survey map. At last I came into Tuttington, a compact, pretty village with flint cottages and houses with Flemish gables. The round-towered church of St Peter and St Paul is tucked fairly tightly behind a large 17th Century house. Unlike Thurgarton, I have been a regular visitor to Tuttington church over the years. It is a church I like a lot. Not being as remote, it is one that easily draws me into its orbit if I am passing close by, and I found my name six times in the visitors book. 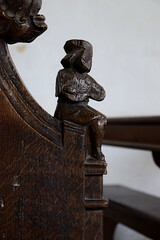 Like Thurgarton, Tuttington has an exceptionally fine collection of medieval bench ends. They are a bit battered, but the damage is as likely to be the rough and tumble of the centuries as much as any form of iconoclasm. 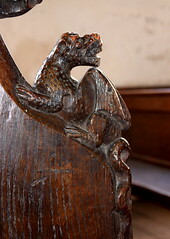 Among them, a grinning wild man with a club creeps up on a dragon, a woman churns butter, a man beats on a tambour, and, curiously, a woman allows her basket to be rifled by wild animals, one of them a fox. There is an elephant and castle, a grinning face peeping out of the castle. There's a man playing a lute, and another curiosity, a man who appears to be feeding a gryphon - or is it eating him? 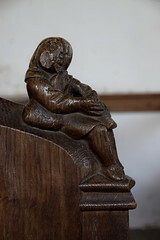 Perhaps some of these subjects sound familiar, and for me on this journey the most striking thing about them is that they appear to be by the same hand as the bench ends at Thurgarton. The subjects have some similarities, the most memorable being the man creeping up on a dragon and the elephant and castle. 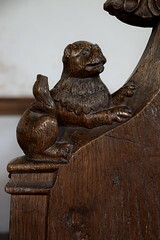 Here too, the man with the gryphon may be part of a sequence in which this one is followed by the gryphon holding the man's head at Thurgarton. Intriguingly, this suggests the possibility that they might all have been in the same church originally. Or are they not by the same hand at all, but simply one 15th Century parish carpenter's clever copies of those of a nearby church?